2) Write an anonymous blog post. It can be about anything you deem taboo on your own blog. Work. Family. Affairs. Crimes of the heart. Crimes of the street. Recklessness. Accidents. Hate. Bitching. Whatever it is that you don't want to share on your own blog. Or under your own name. 2) Share this post with anyone you think would like to join us. The more, the merrier. Right?! 3) Email me your submission no later than NOVEMBER 15 (that's one week from Saturday!). In this email, make sure to include the name and http:// address of your blog. 4) On November 16-17, I will email you someone else's post. It will be stripped of all headers, email addresses and other potentially identifying information. The agreement is I will not reveal the identity of anyone else's submissions. 5) On NOVEMBER 18, you will publish the submission I sent you over the weekend. Feel free to add an introduction regarding the purpose of the post (i.e., that you're participating in a blogging experiment; this isn't your writing; etc. ), but please leave the post itself in the exact form it came to you. Sounds like a fun idea, right? I think this is a great idea for those who are not all that confident with blogging :) Look forward to seeing a secret blogger here! I don't even dare write it for someone else to post. They'd find it, and track me back to my own blog. I know it. I'll tell you my secret.. When my pregnancy didn't work, and I had to have emergancy surgery, I feel like it was all my fault. I lied about still being on birth control. I know that lie has nothing to do with what happened to the way things went, but I still feel guilty for lying to everybody. I don't know why I did it, it just popped out. I'll have to pop over and see some of the secrets! Trish - no, this was the first time I wrote about it. There are some great secrets shared! Anonymous - I hope sharing your secret has helped you in some way! GreenJello - I was worried about the same thing! 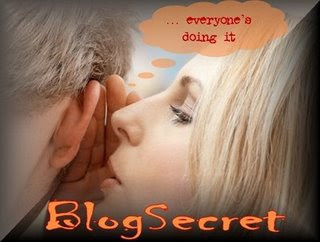 Emmie - I think it's beneficial for anyone, confident in their blogging or not!